Variety is the spice of life! If this is your motto then the Bahamas are your ideal destinations. Each island has its own diversity in geography, culture and art, but the one common element for all 700 islands to share is the warmth and smile inherited by all Bahamian people. In fact a wonderful program called The People-to-People Program was established some years ago to pair up locals and visitors, encouraging cultural exchanges. And if that is not enough, there are miles of empty beaches with crystal clear waters and modern facilities for you to enjoy. Many water sports can be practiced on them such as diving, snorkelling, boating or kayaking. Nature lovers will be enchanted by the gardens and the colourful sea life. Charming colonial villages can be found on many islands and offer hours of leisurely discoveries. Although the British influence still resonates in the air, the mood of the island has become very Caribbean and laid back. 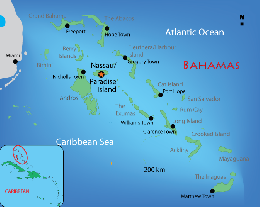 Today the Bahamas enjoys a strong commercial and business centre and tourism is the main focus of the economy.